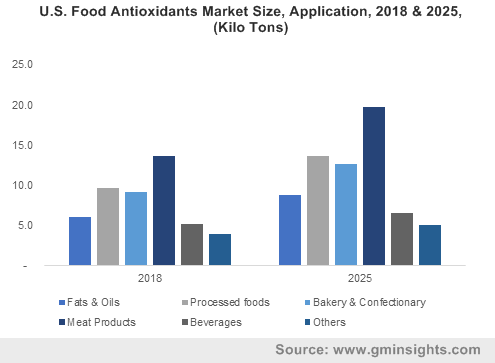 Food Antioxidant Market size was over USD 2.5 billion in 2018 and industry expects demand of above 320 kilo tons by 2025. Increasing consumption of processed food and growing demand for products with longer shelf life is driving food antioxidants market. These extracts preserve food from militate against oxidative deterioration on processing and storage. The product owing to its high stability and low volatility help to maintain the level of nutrients, texture, colour, taste, aroma, and functionality in food & beverages. The extensive use of preservative will fortify market growth by 2025. Food antioxidants are utilized in nutraceutical application owing to presence of flavanols, stilbenes, and isoflavones which help in preventing degenerative and chronic diseases. 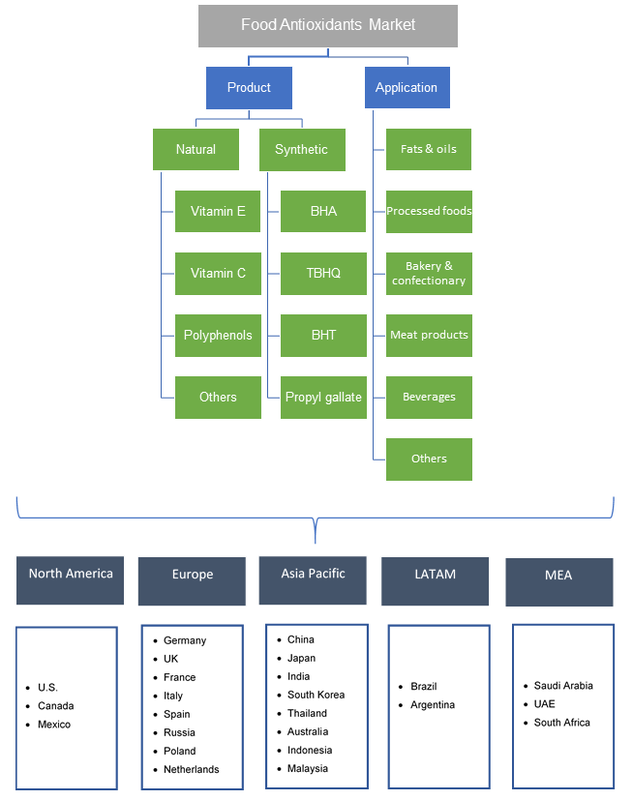 Global nutraceutical market may surpass USD 570 billion by 2025. Rising consumer awareness towards nutritive benefits for health enhancement will drive global nutraceutical market. Effective extraction and appropriate assessment of antioxidants sourced from food and therapeutic plants will promote applications in functional foods as additives. This will further boost food antioxidants market size. Food antioxidants are scavengers of free radicals present in human body. These free radicals can damage DNA, cell membrane, trigger disease including arthritis, deterioration of the eye lens and accelerate ageing process. Foods which have high levels of antioxidant are being promoted by physicians, dietitians, and nutritional industries which will foster product utilization, thus propelling market growth. Some of the natural antioxidants including alpha-tocopherol and ascorbic acid are used in bakery products for delaying the onset of rancidity and minimizing taste and colour deterioration. Global bakery product market may observe gains up to 4.5% in the forecast timeframe. These natural antioxidants are found to be effective in enhancing the shelf life of bakery products, thus escalating food antioxidant market size. Stringent regulatory norm for synthetic antioxidants usage in foods by FDA and EU may hamper product demand. BHA and BHT owing to their chemical structures are not suitable for baking and frying applications. These synthetic products are banned in Japan and utilized in limited level in Europe and Australia. These factors may hamper food antioxidants price trend. Food antioxidants market size from vitamin C may observe gains up to 5.5% in the estimated timeline. Vitamin C is a white crystalline powder utilized to stabilize beverages, vegetables and fruits. The product is used to demolished oxygen, decrease free radicals and regeneration of key antioxidants. It is vulnerable to elements including heat and oxygen and is added exogenously to food, hence stimulating product demand. Food antioxidants market size from propyl gallate may witness substantial gains up to 3.5% by 2025. It is widely used in foods where other liposoluble synthetic antioxidants including BHA, BHT, and TBHQ are not appropriate. The product is infused in different vegetable oils and is used in creation of artificial aromas which will foster market growth. Food antioxidants market size from meat products application is predicted to surpass USD 1.05 billion in the estimated time span. Meat is prone to degeneration and microbial development during slaughtering and post-slaughter handling. Meat suppliers use several food additives to extend the shelf life of meat and meat products. Growing prevalence of natural antioxidants including rosemary extract, tea catechin, tannins for clean label solutions owing to potential health hazards of synthetic antioxidants will further fortify market profitability. Food antioxidants market size from beverages may witness significant gains up to 4.5% by 2025. The product helps to purify human body and protects cells from free radicals that can lead to blood clot formation, cancer, and atherosclerosis. Utilization of product in red wine increases level of high-density lipoprotein (HDL) cholesterol and protect against cholesterol build-up. These factors will boost product demand. Asia Pacific led by India, South Korea, China and Japan food antioxidants market size is predicted to grow up to 5% by 2025. The market is driven by steady innovation in food and beverages for high-performance natural ingredients. Growing inclination towards functional food and beverages in China, India, and Japan will further stimulate market growth. Europe driven by UK, France and Germany food antioxidants market size may exceed USD 800 million by 2025. The product helps to enhance the shelf life of bakery products. Rising demand for bakery products owing to their appealing taste and easy to digest nature is likely to drive regional market growth. Brazil food antioxidants market size may observe significant gains in the forecasted timeline due to rising meat and meat product demand. The product is used by meat suppliers to extent the shelf life of meat products. Growing awareness about nutritious diet and need to impart ethnic taste will play a vital role in propelling the industry size. Global food antioxidant market share is fragmented with major industry players including BASF SE, Eastman Chemical, Kalsec Inc., Kemin Industries, Koninklijke DSM N.V., Givaudan SA, DuPont, and Vitablend. Manufacturers are investing in R&D to cater for large market share. They are also involved in strategic alliances including joint ventures, partnership, capacity expansion and mergers & acquisition to implement innovative technologies to meet rising food antioxidant demand. In July 2018, Kemin Industries launched a new product Fortium RVC, rosemary and vitamin C acid blend, as a substitute to traditional tocopherols in bakery and snack applications, thereby increasing market profitability. Food antioxidants are utilized to extent the shelf life of food products. Lipid oxidation influences flavour, colour, and odour of food. Presence of oxygen, unsuitable processing, storing conditions and improper fatty acid composition help in lipid oxidation. Antioxidant breaks the chain reaction of oxidation from happening and attacks oxygen particles through scavenging free radicals.